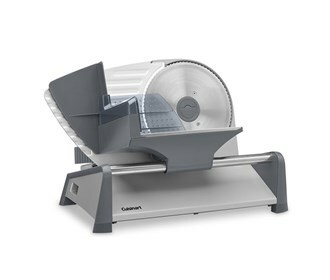 The Cuisinart Kitchen Pro Food Slicer is a professional quality slicer for home use that slices fresh meat, firm cheeses and bread right on your countertop. The slice control knob adjust from 1/32 inch to 1/2 inch thick to slice everything from paper-thin prosciutto to perfect servings of roast beef. 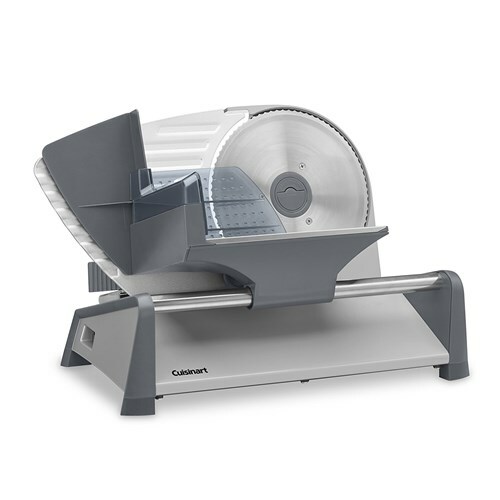 The slicer is very simple and convenient to operate and the removable parts make it easy to clean. The Cuisinart Electric Food Slicer has many exciting features for users of all types. You can extend the lifetime of your Cuisinart Electric Food Slicer with the purchase of a FactoryOutletStore Factory Protection Plan. See the Cuisinart Electric Food Slicer product video and gallery images above for more details. The Cuisinart Electric Food Slicer is sold as a Brand New Unopened Item.